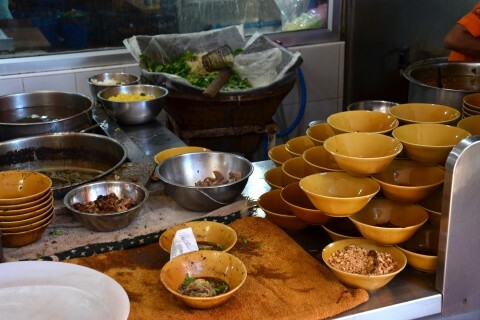 Photo: Boat noodles under construction. When canals were the most reliable thoroughfares and boats plied the “Venice of the East”, boat noodles were Thailand’s answer to delivery pizza. Vendors plied their way across the city selling Chinese-style noodle soups from wooden sampans, calling out for customers as they passed by. The best of them developed loyal followings, differentiating themselves by the types of noodles and spices added to the broth. As Bangkok modernised, those canals were slowly left behind as conduits for people and goods but the noodle vendors had a client base to satisfy. While some scattered to the winds, others stuck close to their former waters and set up shops along the canals they used to ply. Today there's a fantastic congregation of boat noodle places along a canal just north of Victory Monument in central Bangkok. Noodles normally come in three varieties: sen lek, sen yai, and baan mee (thin firm rice noodles, wide soft rice noodles, and chewy wheat noodles, respectively). Pork and beef are always represented, usually in the form of muu daeng (roasted red pork) and luk muu (round balls of finely ground pork) as well as tender pieces of stewed beef. Soft tofu and Luk plaa (round balls of finely ground fish flesh) are often on the menu as well. Tiny portions are the norm, charged up and down a canal-side alley at 11 baht per bowl — most people eat three or four to fill up, which gives a chance to try all the flavours! Our favourite broth is nam tok, a name that means "waterfall" and refers to a cooking method in which the juices from roasting beef or pork drips gradually into a simmering broth. We suggest starting with this rich and savoury soup before moving on to a bowl with tom yum, a lighter and slightly sour broth usually served with pork. Do leave room for one of the mini-cups of coconut custard that always sits on the tables ready to eat. "Boat noodle alley" hosts at least half a dozen different shops, including a large two-storey eatery at the front and several small canal-side shops set further back. They open in the morning and get busy with office workers around noon. Several shops stay open for dinner as well. Most of them offer basic English menus. To get to boat noodle heaven, exit Victory Monument BTS station to the north (towards the actual monument and traffic circle). Follow the walkway around the circle to the right and take the stairs down to the right (east) at the northern side of the traffic circle, with Phahonyothin Road running north. Look to the right as you pass over the canal and you’ll see the restaurants along the water. Descend the stairs and back track to the canal — pick a restaurant and dive in! Last updated on 23rd July, 2016.